The EnviroStick™ Ball Pen is a revolutionary development because it is the world’s first and only pen to feature a fully post-consumer recycled refill. The matching cap and nosecone is also made from the same recycled Tetra Pak™ cartons and the white barrel is constructed from recycled polystyrene. 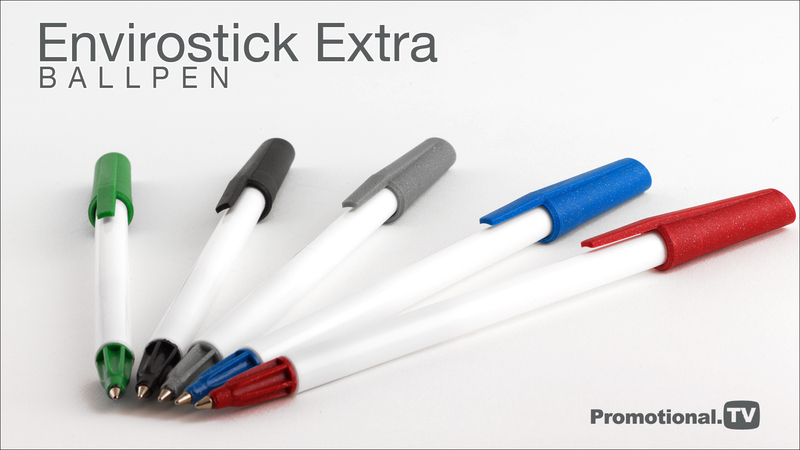 If you want a truly recycled pen for your next eco promotion the EnviroStick™ is the perfect choice. It is fully compliant with current safety regulations; comes with a black refill containing documental quality ink and is available on a optional express service for those last-minute requirements. The EnviroStick Extra Ball Pen has a removable cap that fits on either end of the pen body and it contains a large breather hole to make it child-safe. The large barrel print area can be personalised in one colour and this can be matched to your requirements. This pen can be provided with optional presentation packaging, including high visibility pen pots to display at your next corporate event.